Tag Archives for " Susan Baier "
You know what I love about the fact that I’ve been in business as long as I have – I finally figured out who I want to work with. No, really, it takes time. I’ve been working with my ideal client for a number of years now but it’s still a work in progress, constantly evolving as the world evolves. Once you figure out who makes an ideal client for your business, it’s job number one to go out and communicate with them in a way that helps them understand your ideal business or individual to help them get what they want. Basically, I’m talking about what marketing have long referred to as market segmentation, but it’s taken on new, important dimensions of late as much of the buyer’s journey is now controlled by the actual buyer. 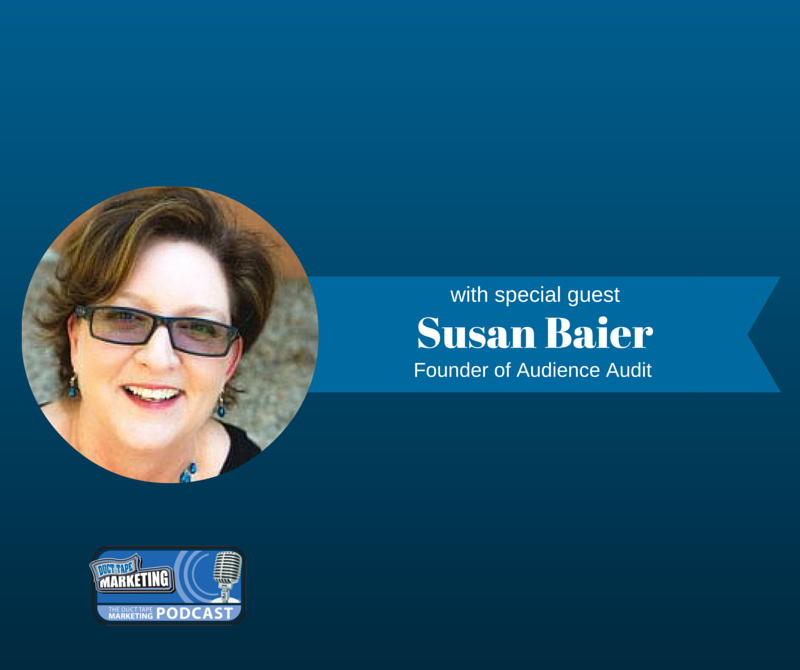 My guest for this week’s episode of the Duct Tape Marketing Podcast is Susan Baier, Founder of Audience Audit – “a little research company with big ideas.” Audience Audit provides custom segmentation solutions for smart agencies and their clients. Susan and I talk about market research and the strategies associated with segmentation. Having more than 25 years in product and brand management, market research, and strategic planning, Susan has developed a passion for helping companies identify their ideal audience. When businesses hear the term “research,” often they feel that it’s going to be expensive and not always relevant – how do you react to this? What’s the best approach for small businesses that don’t have a ton of funds or resources? How do you take culture into consideration when you’re helping a business identify their target audience? Learn more about Susan Baier and Audience Audit by clicking here. Check out the newly launched online program, Audience Axis, designed specifically for small business owners.